Both trailers and featurette for Tom Hooper's 'Les Misérables,' starring Hugh Jackman, Russell Crowe, Anne Hathaway, Amanda Seyfried, Eddie Redmayne, Aaron Tveit, Samantha Barks, Helena Bonham Carter and Sacha Baron Cohen. 'Les Misérables' is the motion-picture adaptation of the beloved global stage sensation seen by more than 60 million people in 42 countries and in 21 languages around the globe and still breaking box-office records everywhere in its 27th year. Helmed by "The King's Speech's" Academy Award®-winning director, Tom Hooper, the Working Title/Cameron Mackintosh production stars Hugh Jackman, Oscar® winner Russell Crowe, Anne Hathaway and Eddie Redmayne. Set against the backdrop of 19th-century France, 'Les Misérables' tells an enthralling story of broken dreams and unrequited love, passion, sacrifice and redemption–a timeless testament to the survival of the human spirit. Jackman plays ex-prisoner Jean Valjean, hunted for decades by the ruthless policeman Javert (Crowe) after he breaks parole. When Valjean agrees to care for factory worker Fantine’s (Hathaway) young daughter, Cosette, their lives change forever. 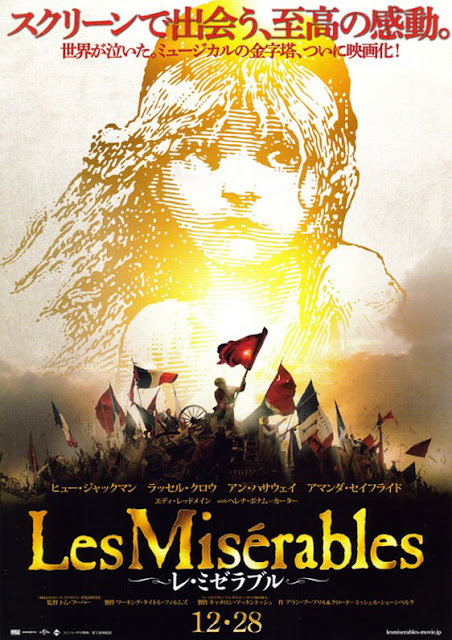 'Les Misérables' opens 25 December for the US, 11 January 2013 for Ireland and the UK.